Notes: you can prepare this recipe with or without oil but substituting the coconut oil for an oil-free vegetable broth. When blending this recipe, I use an immersion blender but you can use a standard blender. If you make blended soups on a semi-regular basis, I would highly recommend an immersion blender - they range in price from $15 to $50. The one I use is from Cuisinart and it’s only $29. 3 medium sized russet potatoes, unpeeled and diced (you want them bite-size so dice them small! Saute the diced onion, potatoes and minced garlic with either 2 Tbsp coconut oil OR ¼ cup vegetable broth (oil-free version) for 5 minutes over medium heat. The onion will become slightly translucent. Make sure to stir regularly to avoid burning and be careful not to burn the garlic. Add 32-ounces of vegetable broth, 8 ounces of filtered water and the organic corn and simmer for 15 minutes. 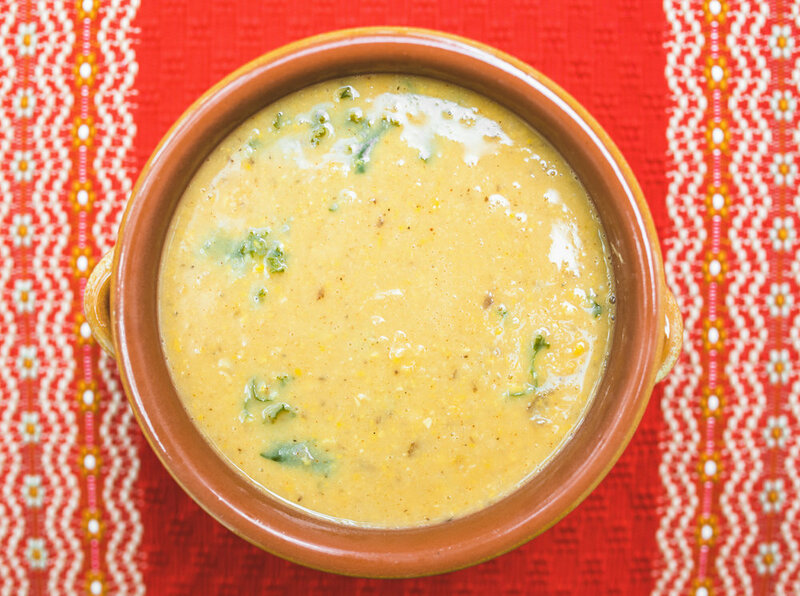 Stir in the coconut milk (if solid at room temperature, blend smooth first), 1/4 cup nutritional yeast, 1 tsp garlic powder, ½ tsp onion powder, 1 tsp smoked paprika, 1.5 tsp salt and ½ tsp black pepper and simmer for another 5 minutes. Next - using a ladle, scoop 3 cups of the onion, potato and corn from the pot and set aside in a small bowl. Blend the remainder of the soup in your pot using an immersion blender in the pot or by carefully ladling it into your blender. Blend until it becomes a smoother consistency and there are no more chunks. This is your creamy base. If you’re using a standard blender, carefully ladle the mixture back into your pot. Once your creamy base is back in the pot, add the 3 cups of onion, potato and corn you set aside back in the pot. Stir the kale leaves into the soup . Cover and simmer for another 10 - 15 minutes (you want the kale leaves to be wilted in the soup).